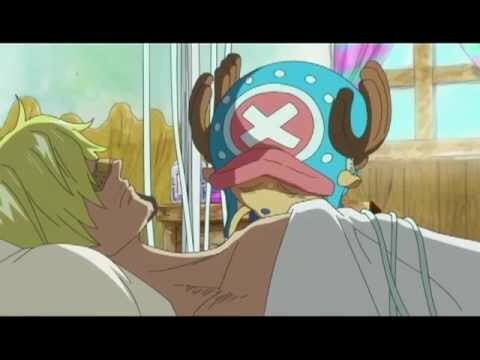 One Piece - Rozdział 932 -Spoilery | One Piece! In the Cover, Caesar writes on papers and the goats eat it. The Shugon an afraid of Komurasaki. it seems that Komurasaki stopped the orochi oniwabanshu. Cytat: The Oniwabanshu gets Robin. Robin says "I'm the witching hour boy, I came here to investigate on the flow of money in Flower Capital." słabe czytadło się szykuje w tym tygodniu..
Cover Page: Caesar is writing a hiring poster devotedly to hire people to help him build lethal weapons. A goat is eating his paper. At the banquet, everyone is immersed in the music Komurasaki is playing.Oniwabanshu questioned Robin. Robin claimed herself to be Witching Hour Boy and that she is here to investigate the money flow in the Flower Capital.The head of Oniwabanshu gives order to arrest Robin. Robin is attacked. The next second she turns into flower petals and escapes. Yup that Robin is merely a substitute using her DF power. 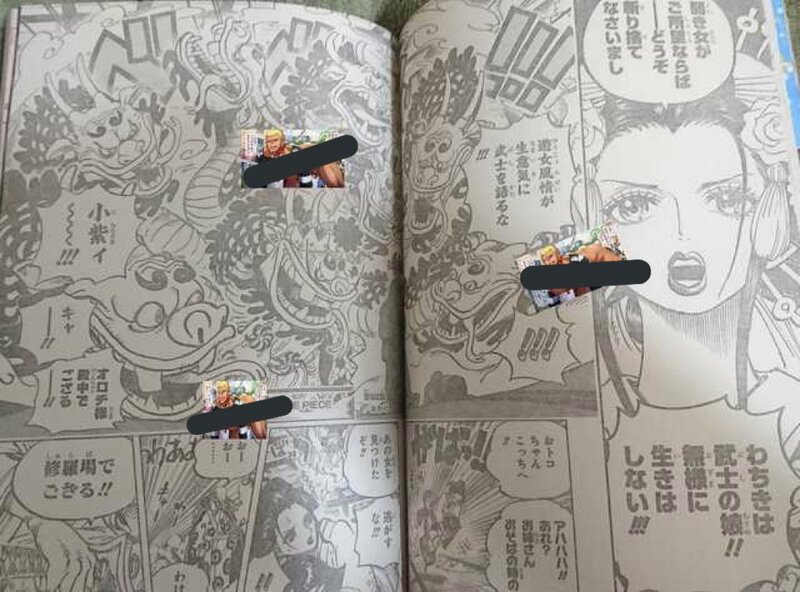 While escaping, Robin contacts Nami, Shinobu, and Brook and tells them there are at least 11 ninjas in the mansion.The head of Oniwabanshu orders them to continue pursuing Robin. 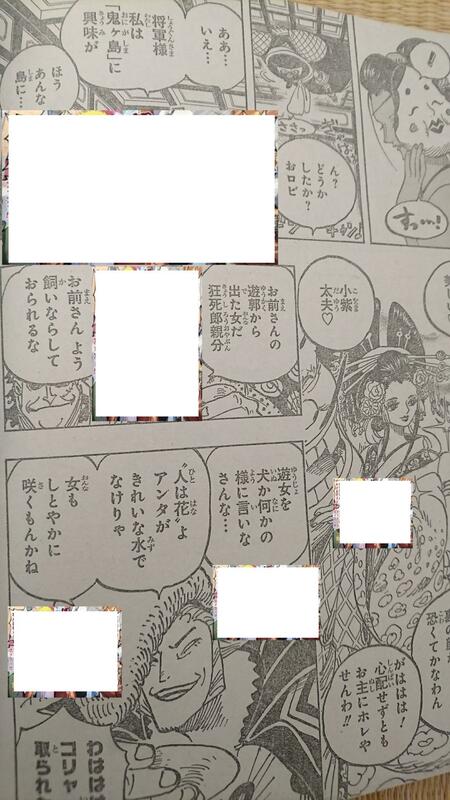 Robin returns to the banquet.Orochi shouts at the people at the banquet: It's the 20th year after Kouzuki Oden's death and is said to be the year of revenge according to his wife. Oden's will still exists in this world.One of his men appears to be impatient and says: Here he goes again...Orochi goes on: "Do you remember the extraordinary power of the Nine Red Scabbards? The one with leadership skills among them, Kinemon, is a man with a quick and smart mind! ""They will revive after these 20 years and get prepared!!! In order to take my head!!! 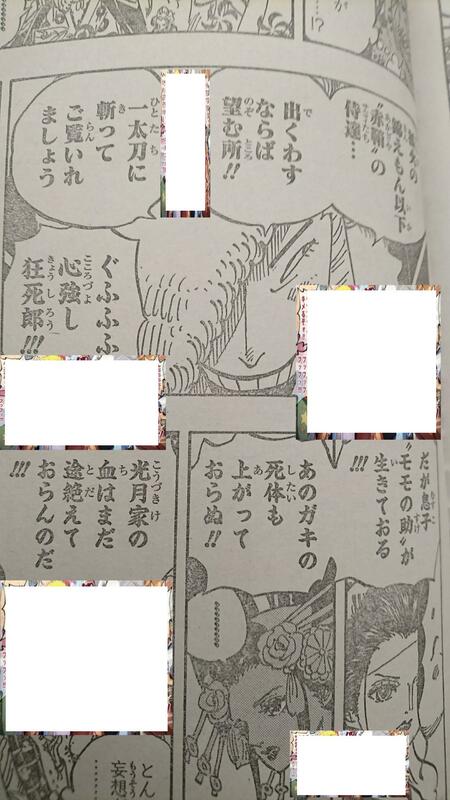 "His men don't care a bit about his words.Orochi mentions the Yokotsuna incident in Kuri, the fact that Jack's henchmen were attacked, and the soba-stand incident (Sanji), the fact that Yakuza were attacked by the Ronin (Zoro). "They were all directed by Kinemon behind the curtain! "Upon hearing Orochi's words, Kyroshiro tells him "I wish the Kinemon's Nine Red Scabbards appear! I'll take them down without even blinking. "Orochi immediately praises Kyroshiro and continues: "Oden died in front of my eyes but his son is still alive! No one has ever found that brat's corpse! The bloodline of the Kouzuki Clan has not been ended! They are still working to revive the Kouzuki Clan! I believe that they want Kaido's head too. "His men are trying very hard not to laugh. They think that their boss is delusional.And they hear laughing - from O-toko.Orochi is furious for someone laughing at him. He wants to kill O-toko but Komurasaki stands out and stops him.Orochi still wields his sword. Komurasaki stands in front of O-toko and slaps Orochi right on his face.Everyone is panicked and one of them tells Komurasaki to "kneel and apologize immediately".Komurasaki is dead serious and says: "I will not bend my knees to anyone! You can kill me, a harmless woman, but I'm a samurai's daughter and I will never yield or surrender! "Orochi is so furious that he turns into Yamata no Orochi. 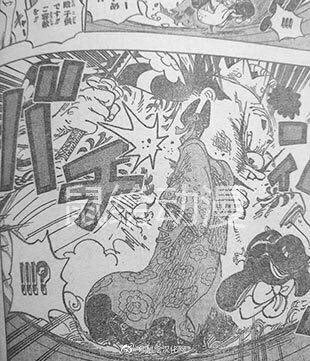 Komurasaki is facing danger.At the same time, Oniwabanshu finds Robin. Everything is in chaos, and Kyroshiro clenches the hilt of his katana. END.